This was the last of Ian Berne's A class flash steam boats. The plant held the record at 118+mph for 11 years, whilst the hull was a new and lightweight version built by Norman Lara. Sadly, ill health prevented Ian from ever running the boat although Norman and the late Terry Everitt did run it on a number of occasions. Remarkably, there is no facility for a starting cord, so flicking the prop was the only way to get everything running. We know this boat was owned and run by Mr Perkins of the Wicksteed Club from around 1933 onward, although we believe his initials to be HR. It is seen here in an Edgar Westbury photo with the later modified Bond's motor. It is hoped to feature both of these boats (see below) in a Pitbox special as their renovation progresses. All we can ascertain so far is that this boat was one of the very first to be run at the newly formed Wicksteed Park Club in the early 1930s. It is shown in a photo from 1934 in a line up of club members and the only clue we have is that it is with another boat that we can identify and will feature next month. We believe that they belonged to the same person. 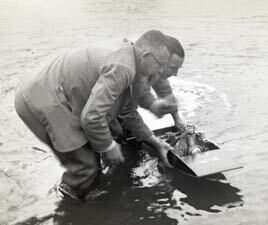 This is due to the motor seen here being in the named boat in the late 1930s. 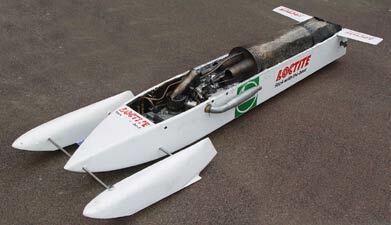 This was Tom Clement's first hydro, with a motor that he had built. 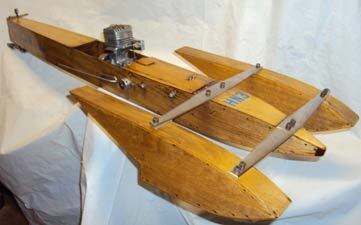 The 10cc engine was constructed from a set of drawings, patterns and castings based on a 1066 Conqueror given to him by his mentor Jimmie Jones, hence the name of the boat JWJ. Tom ran this boat from around 1971 through to 1978/79 when he moved up a gear with an OPS redhead. JWJ was good for the mid 50s and won the Birkenhead Open Regatta in 1978. Jim Jamieson has done another superbly sympathetic restoration on this boat as it was in something of a state when we featured it in September 2012. This was the late Tom Clement's D Class hydro, built to the Lambert Hyder design and powered by an ETA 29, which he ran from 1968 right through to 1980. This was the only one of Tom's boats that he 'could not find' when OTW visited him a few years ago so we are delighted that it has been re-located. 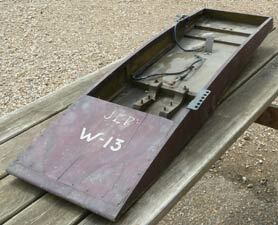 Following Tom's death, the boat, named after his mother, has been sympathetically restored by Jim Jamieson. This boat, based on George Lines' Sparky, was raced at the Victoria Club in the late 60s by a Mr J V Chandler of Southend. The 15cc motor was originally built by Mr Dixon and has the same arrangement for varying the compression as did the original. The boat was offered for sale on eBay and attracted a great deal of interest, with the final price taking everyone by surprise. 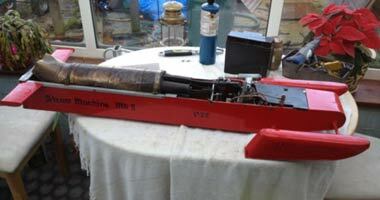 Again far from conventional, although an outrigger hydro, but with adjustable sponsons. The back end of the boat is most interesting with an after-plane, enclosed propshaft and vented prop blades. George Stone and Lady Babs set a new outright hydroplane record in 1949 just on 20mph quicker than the existing record, adding another 5mph two years later. This feat changed the sport forever, as the motor was a 10cc Dooling two-stroke rather than the home built 30cc four-strokes that had previously held the record. From then on the sport became dominated by the 10cc class, and apart from two notable exception, by commercial motors. Unfortunately, this change was not without its critics and we hope to bring you the full story of George Stone and the influence he had on the sport at a later date. Now available. Vic Collins started racing hydroplanes just after the war and continued until ill health overtook him. He persisted with four stroke motors throughout his career, working them up from a very pedestrian 30+mph to a fraction under 100mph. The elderly Sharkie was superseded by a modern hull, which demonstrated the speed obtainable by the venerable Westbury designed, but much modified motor.